Goddess Durga represents the power of the Supreme Being that preserves moral order and righteousness in the World. Goddess Durga, also called Divine Mother, protects mankind from evil and misery by destroying evil forces such as selfishness, jealousy, prejudice, hatred, anger, and ego. Goddess Durga represents a united front of all Divine forces against the negative forces of evil and wickedness. 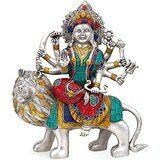 Goddess Durga represents a united front of all Divine forces against the negative forces of evil and wickedness. Size : 9.2 Inches Height X 8 Inches wide X 2.2 Inches depth. Weight : 3 Kg , Material : Brass, (Silver , Gold Polish With Turquoise and other coral stone Handwork. )..-------------- Pls beware from Copy product & ensure buying authentic product. This is exclusive inhouse design & product of Brand "Collectible India" and "covered by intellectual property rights laws". 'Collectible India' doesn t authorize any other Brand/Seller to sell it and we won't be responsible if any counterfeit or substandard product send by any other seller.